Q. What are the benefits of Hendy Wind Farm for the local community? As well as making a positive contribution to renewable energy in Powys and Wales, the scheme will create a pot of community funding – around £2m pounds over 25 years – for investment in the local area. If you have ideas on how this can be spent. Would the area benefit from subsidised high speed broadband? Would you welcome a travelling cinema? Could the money be put towards education scholarships? Do the local highways need improving? Please tell us at the public exhibition or contact us. Q. What stage are the plans for Hendy Wind Farm at? An application for temporary planning permission (12 months) for an anemometer mast on the land has already been granted by Powys County Council (Ref: P/2012/0932). A planning application for Hendy Wind Farm has now been submitted to Powys County Council (Ref: P/2014/0672) and a decision is likely to be made in autumn 2014. Although the application has been submitted, Hendy Wind Farm Ltd still wants to hear your feedback on the proposals. Please contact us to give us your views. Q. What infrastructure would be required at Hendy Wind Farm? Underground electricity cables are to be installed in trenches to both supply electricity to the turbines and deliver the generated electricity to the sub-station. The trenches will be approximately 1.5m deep and will generally follow the route of the tracks. Power will be exported to the Llandridnod Wells sub-station. Q. What will be the environmental impact of this development? The site is currently farmland and is mainly used for grazing, with no environmental designations on the land. A full Environmental Impact Assessment has been prepared for submission with the planning application, and any threats to wildlife in the area will be avoided where possible or mitigated. In this way we ensure that the site is sympathetically designed in the best interests of the local wildlife, landscape and people. Q. Will I be able to see the turbines from my home? 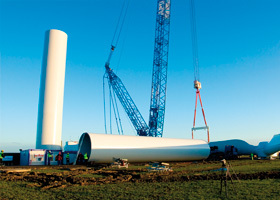 The turbines will be up to 110m tall from ground to blade tip, with a height to hub of 80m. The diameter of the blades would be 82m. An illustrative drawing of an example turbine is provided on the project page. A landscape visual and impact assessment (LVIA) has been undertaken and included within the Environmental Impact Assessment submitted with the planning application. As part of the LVIA, the layout and turbine size of the proposed development has been carefully considered. This is to ensure that the turbine layout forms a coherent group when viewed from the surrounding landscape. The result effectively contains the potential visibility of the proposed turbines with a limited area, thereby restricting potential significant effects on landscape character and visual amenity. Q. What is shadow flicker and how could it affect me? Shadow flicker is the flickering effect that may be caused by the shadow of rotating blades crossing a narrow opening, such as a window. It can only occur when the window is in the same line as the sun and a turbine. The sun also needs to be bright enough to cause shadows. Shadow flicker is reckoned only to cause a nuisance within ten rotor diameters of the house. As we have kept the turbines as far as possible from housing, we do not expect shadow flicker to be an issue at any dwelling, but mitigation can be installed if it proves to be a nuisance. Q. Why are you proposing a wind farm in this location, when it is not within the seven Strategic Search Areas (SSAs) identified in Technical Advice Note 8 (Tan8): Planning For Renewable Energy (2005)? TAN 8 does not prohibit the erection of wind farms less than 25MW which are outside the SSA. The site is considered particularly suitable for the development of a wind farm due to its contained views.